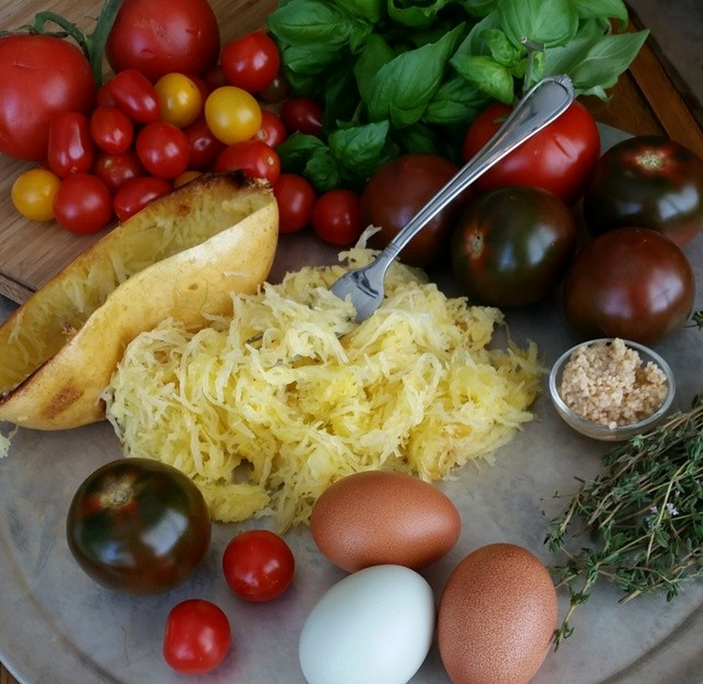 I really enjoy the taste & texture of spaghetti squash. I really loved this entire idea! 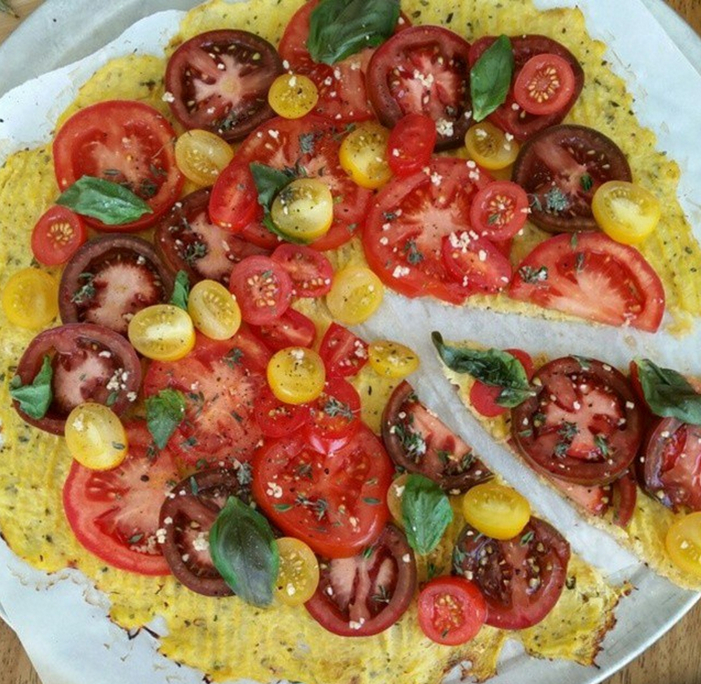 NOT EVEN CLOSE to crispy crust pizza, but a fantastic meal, that has so many variations! Use paper towels to soak up moisture. This is VERY important. If there is moisture left in the squash, you will have soggy crust. In a large bowl, mix squash, 1 egg, 1/2 teaspoon sea salt, 1/2 teaspoon dried Italian seasonings. 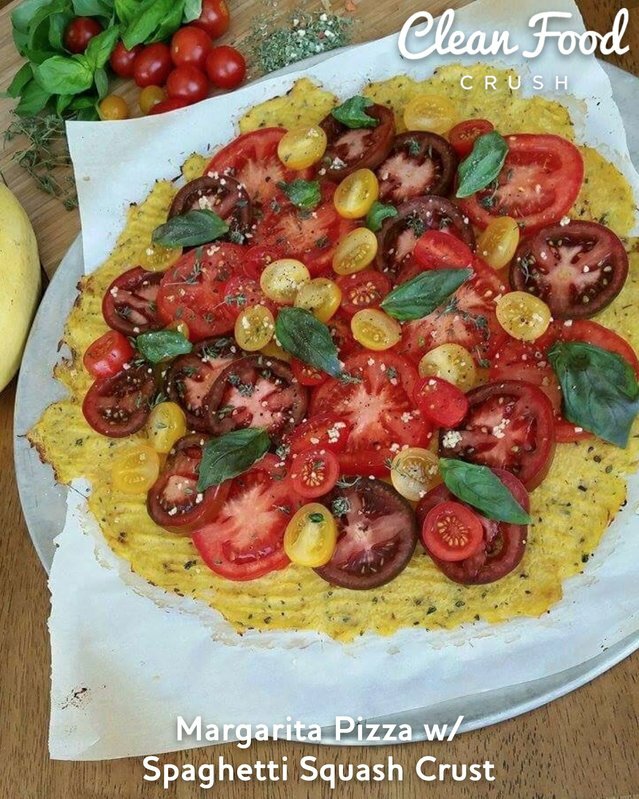 Spread crust mixture very thin on a parchment or foil (foil=crisper) pizza sheet pan. Bake 20-25 minutes until edges are browning. This is where you can have fun! I used several varieties of tomatoes, fresh basil, fresh thyme, fresh minced garlic, sea salt and pepper. That’s it! A thin layer of store bought, all natural (low sugar) marinara. Fresh, all-natural slices of Mozzarella cheese. Cooked, crumbled lean ground meat, such as turkey, seasoned with Italian seasonings. Arrange toppings on your crust, bake in your 400 degree oven for an additional 5-7 minutes. Keep an eye on it, if you added cheese. Do you like Creative Clean ideas like this one?